The very first time I led people in worship was in January 1983 in Woodward, Oklahoma. But there was just one problem. Snow. Everything, including the roads, was covered in snow. In the Northeast or upper Midwest, that is just normal fare for those folks, but that is not the case in Oklahoma. People stay home in weather like that. In spite of the inclement conditions, twenty-five faithful showed up that night and we had almost as many, about twenty people, onstage. As everyone began singing, we experienced one of those holy moments when the Spirit starts sweeping through the room — wall to wall and floor to ceiling. The spiritual realm converged with the physical world and we could literally feel it. What began to happen wasn’t because of my nervous voice or piano playing, which at that point was mediocre at best, but rather because I made the choice to step out into what God had called me to do. People followed me as we dove deeper into His presence. That was my very first adventure of leading God’s people to His throne, and I have never stopped since that night. God interrupted my life on that snowy evening in the presence of a handful of good, godly people by creating something in my spirit that allowed me to have a taste of heaven. I was like a beggar who got word of a banquet. I wanted others who were starving to find the feast too. 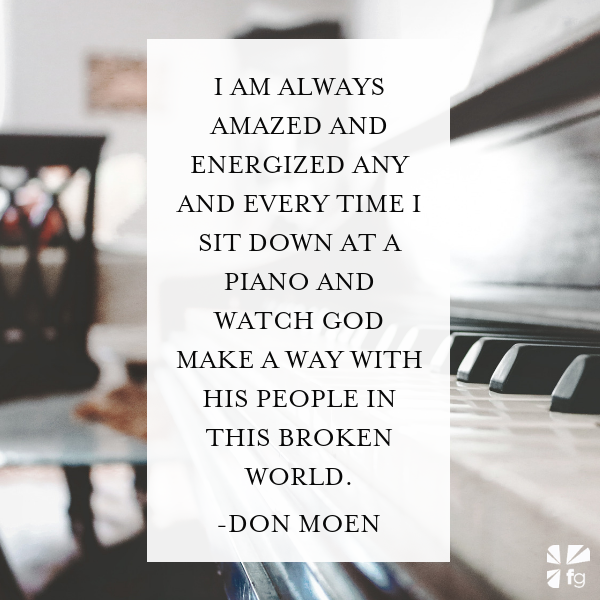 I am always amazed and energized any and every time I sit down at a piano and watch God make a way with His people in this broken world. Someone once told me, “Don, your piano is your pulpit. Don’t be intimidated by great preachers. You do what God has called you to do. When you sit at the piano and lead worship, you will experience His favor.” I have never forgotten that word of empowerment and affirmation to lean into and trust what the Father has placed in my hands and heart for His kingdom. In your own life, there either has been or will be your own version of a holy moment like I had in Oklahoma. We must pay attention and watch for those times when God reveals His calling for us by His interruptions. In the 1981 Academy Award–winning film Chariots of Fire (the true story of Eric Liddell, the Scotsman who ran in the 1924 Olympics), there is a scene where his sister is expressing her deep concern to him that his competitive running is pulling him away from their commitment to go to China together as missionaries. Eric looks deep into her eyes and tells his sister, “I believe God made me for a purpose, but He also made me fast. And when I run, I feel His pleasure.”1 He did run in the Olympics but also went on to serve the Lord in China. One of the most beautiful yet amazing ways that we know we are fulfilling our purpose and tapping into the heart of God is when we “feel His pleasure,” as Liddell explained to his sister. Knowing deep down that the activity in which you are engaged is a gift from your Creator and why He has placed you on this planet. That gift, that calling, is a part of you that just feels supernatural and you know when you connect with the passion that it is not about you but rather about God touching and reaching others through you. I was leading worship at Pastor Jack Hayford’s Church on the Way in California when he came up to the stage after one of my songs and said, “Don, I don’t know if this is Jack Hayford or the Holy Spirit, but I feel that we are supposed to take a few minutes and pray for those who are sick. Does that bear witness with anyone here?” As I continued to play quietly and lead in worship, Pastor Hayford came to the front as about two hundred people eventually walked to the altar for prayer. I’ve always been so impressed by the way Pastor Jack handled that situation and I learned so much from him in other moments like that one. He could have adamantly stated, “God is telling me that we’re supposed to pray for those who are sick.” With his credibility and authority, no one would have questioned him. But instead he very humbly shared, “I don’t know if this is Jack Hayford or the Holy Spirit.” Wow! He instantly had my attention. I wish more Christian leaders would present their promptings that way, because that’s exactly how I feel most of the time. Is this thought I have right now from God, or is it just the pizza I ate last night? The reason that I had absolutely no problem with Pastor Jack “interrupting” my concert was because I know he hears from God. I trust his walk with Christ and his many years of successfully ushering the kingdom onto the earth through his ministry. Throughout my career, I have come to love when the Holy Spirit disrupts and intervenes in the plans of man, including this man. Sometimes the most important part of my worship concerts is what happens in between the songs as He speaks. Listening intently for the Father’s voice in any setting or situation is a vital part of our relationship with Him. But how can we identify those moments when they come? We need to anticipate His involvement in our lives and expect Him to show up, whether in a worship service or a simple lunch meeting with a friend. That’s why I love the story of Jesus interrupting the disciples’ conversation on the Emmaus Road, recorded in Luke 24. Two of Jesus’ disciples, evidently not any of the original twelve, had left Jerusalem when they found out that His body was missing from the tomb. Disappointed and disillusioned, they left, thinking the story was over. Jesus must have really loved these guys because He came after them to reveal why they needed to go back to join the others. Christ walked up to them and asked, basically, “What’s up, guys? What are you talking about?” For whatever reason, they did not recognize Him. They got a bit edgy that this apparent stranger would even ask such a question after what they had been through. Finally, they explained to Him their take on Jesus and what happened. Let’s look at what occurred next. Imagine for a moment having Jesus tell you the story of the Bible from Moses through the Prophets, connecting all the dots straight to Him! What an amazing intrusion that changed those men’s lives forever. God has those same types of life interruptions planned for us. James Young, “Mach Buster,” Chuck Yeager, accessed March 7, 2018, http://www.chuckyeager.com/1945-1947-mach-buster. “I Believe There Is More” by Don Moen, Claire Cloninger. © 2008 Integrity’s Hosanna! Music (Admin By Capitol CMG Publishing) / ASCAP, Juniper Landing Music (Admin By Copyrightsolver). Excerpted with permission from God Will Make a Way by Don Moen, copyright Don Moen.